This site is dedicated to the Polish War Graves in Western Europe. You will find here information about the deceased servicemen as well as about the civil cemeteries and War Cemeteries in which they have been buried. 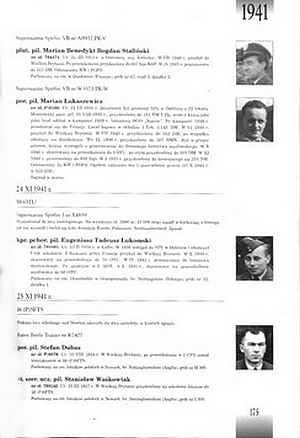 "KU CZCI POLEGŁYCH LOTNIKÓW 1939 - 1945"
This impressive documentation has been compiled by the four Polish researchers Robert GRETZYNGIER, Wojtek MATUSIAK, Waldemar WÓJCIK and Józef ZIELIŃSKI. The book provides details about killed Polish airmen and a lot of photos of aircrafts, crews, funerals, graves, cemeteries and - surprisingly - even pass photos for most of them. The most important reason for our recommendation of this book, however, is that it also contains pass photos of most of the killed Airmen. you'll find at any rate information about the person you were looking for. you'll find a passport photo of the person involved.